We all want the best for our dogs. And when we think of the things that improve a dog’s life, we can all agree that nutrition is at the top of that list. More and more people are making the switch to homemade food, but we don’t all have the time (or knowledge) to create meals that meet our dog’s needs. So, we look for the next best option. To many of us, that’s a homemade meal delivery service. Someone else to give us exactly what we need to feed our pets the best. Two of the top companies for homemade pet food delivered straight to your door: The Farmer’s Dog vs. NomNomNow. But it can be difficult to know the differences. Is one company better or worse? Research is a hassle—so we did the work for you. Mauja, Atka, and Kiska have been trying the food from The Farmer’s Dog and NomNomNow for several months now, so I’ve had a chance to see how it works for them. Now, let’s put them head to head to see what they offer—so you can determine the best choice for your pet. The floofs need variety. They get bored very easily, so I have to constantly mix up their diet. Plus, there are a lot of benefits to rotation diets. So I’m always trying new brands and recipes with them. The Farmer’s Dog has three recipes: Beef & Lentils, Pork & Sweet Potato, and Turkey & Parsnip. NomNomNow boasts four recipes—perfect for those chicken lovers: Heartland Beef Mash, Tasty Turkey Fare, Chicken Chow-Wow, and Porkalicious Potluck. Porkalicious Potluck: Ground pork, russet potatoes, green beans, yellow squash, brown mushrooms, kale, dicalcium phosphate, salt, fish oil, vinegar, citric acid, taurine, choline bitartrate, zinc gluconate, ferrous sulfate, vitamin E supplement, copper gluconate, manganese gluconate, thiamine mononitrate (vitamin B1), selenium yeast, riboflavin (vitamin B2), vitamin B12 supplement, cholecalciferol (source of vitamin D3), potassium iodide. Your cost will vary based on recipe chosen, current weight and target weight, activity level, and delivery frequency. Here’s a breakdown of the costs for each dog food subscription service. To keep things similar, I used the Beef & Lentils recipe from The Farmer’s Dog and the Heartland Beef Mash from NomNomNow. Quality is always top of mind when researching dog food. We have very high standards here—our dogs eat better than we do. I can’t be alone in that! Customization is another important thing for me. 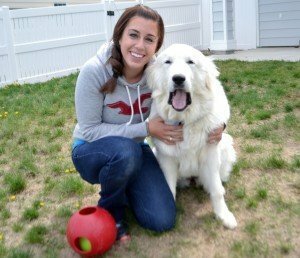 With having dogs of different sizes and activity levels, I need their meals to be customized. Plus, I rotate their food a lot. We’re always adding new things, so I don’t like having to purchase food like it’s their only source of nutrients. Feeding giant breeds is expensive, so I really love how customizable food The Farmer’s Dog food is. If you want to use it as a mixer or a topper, it’s extremely easy to do. In your profile, you can adjust daily portion sizes to fit your needs and budget—it will even show you the cost difference right there. You can also adjust the shipping frequency to cut down on cost or save fridge space. Meals can be delivered every 7, 14, 18, or 20 days. For dogs that get bored with one flavor easily, multiple recipes can be added at no extra charge. My biggest complaint about NomNomNow is its lack of customization. Unlike The Farmer’s Dog, you can’t tailor how much food you’ll be feeding if you want to mix with dry food. As much as I’d love to feed fresh full time, it’s just not in the budget. Giant breeds are expensive, y’all. However, you can alter how frequency the meals are shipped to save money or fridge space, but you don’t have as many options. Meals can be shipped every week, two weeks, or monthly. You also have the ability to mix multiple recipes per shipment to keep your dog interested, but it’ll cost you an extra $5. However, if you just want to keep your dog guessing, you can have a new flavor shipped each order without the added cost. The food arrived in a cardboard box—extremely sturdy and pyrfect for kitty condos (at least that’s what Indie says). It’s lined with a biodegradable insert made from cornstarch. Nick makes fun of me because it’s my favorite part about unpacking their food. You pull out the liner, stick it in your sink, run water over it, and watch it slowly disintegrate. The box also has a few packs of dry ice to keep your order fresh during delivery—all made from BPA-free materials and non-toxic. I also love that the box comes with feeding instructions for each dog, and a few recipes for homemade food. But, to be completely honest, the food packaging is my biggest complaint about The Farmer’s Dog. Instead of single serving packs, you may have more than one meal per package—depending on the feeding plan you’re following. For certain weights and feeding amounts, you’ll use an entire package. But this isn’t always the case. The other thing I’m not a fan of with the packaging is the fact you have to use scissors to open them—rather than a tear and pour package. It’s not a big deal, but I end up needing to wash my scissors after I open each package. Similar to The Farmer’s Dog, NomNomNow comes in a sturdy cardboard box. Inside is a liner—either a silver or brown recycled fiber in a plastic film—that can be tossed in your recycling bin. Like The Farmer’s Dog, it also contains dry ice to keep your dog’s food fresh during delivery. Place the dry ice in a well-ventilated area to break down, then dispose of the packaging. I love the meals are all prepackaged, so you can avoid putting messy bags back in the fridge. NomNomNow’s single-serving packages are ideal for the dog mom on the go. Simply peel open the package, empty into the bowl, and serve! Then, rinse the bag and toss in your recycling bin. The Farmer’s Dog recipes are formulated by board-certified veterinary nutritionists. While they don’t specify any veterinarians in the creation process, vet endorsements are noted on their site. NomNomNow recipes are formulated by leading vet nutritionist and NomNomNow’s Chief Nutrition Officer, Dr. Justin Shmalberg, DVM. He is an expert in pet nutrition and rehabilitation and is dedicated to unlocking the benefits of whole, fresh nutrition as preventative medicine. Anyone can try two weeks of The Farmer’s Dog for 20% off. But, we have a better deal for you. We have a special offer for 50% off your first two weeks. NomNomNow also gives a great discount for your first box. Try it now with 20% off your first week. The verdict is… it depends. When comparing The Farmer’s Dog vs. NomNomNow, I can’t pick a clear winner over another. Two key points do stick out to me, that might be the deciding factor for you. Customization for The Farmer’s Dog is much better. I like that I can mix and match their meals, and easily change my plan based on how much of the food I want to feed. Packaging for NomNomNow is much better. The single-serving food packages are less messy and easy to dispose of. I’m going to continue using both dog food delivery services, depending on our needs at the time. My advice? Give them both a try, and see what your dog thinks! 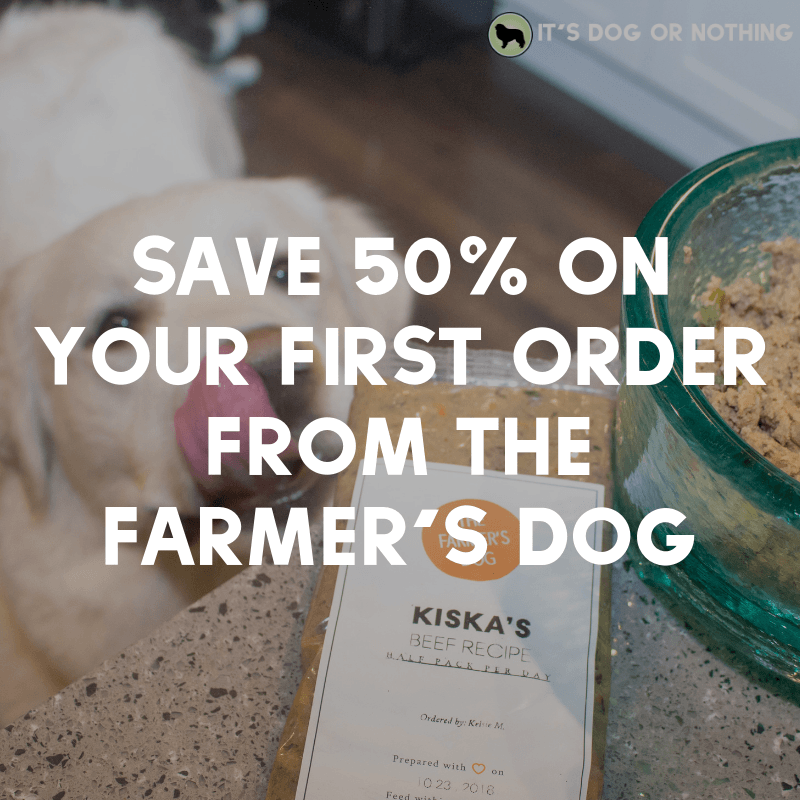 Try The Farmer’s Dog for 50% off and NomNomNow for 20% off! Interesting write up. I am for the most part a devoted Farmer’s Dog . I agree that FD must continue to improve their packaging .Customer Care if outstanding for FD. When my Australian Cattle Dog rescue was diagnosed with Liver Cancer, and passed away the FD sent us a gorgeous floral arrangement…very thoughtful. I have a new puppy who loves their food mixed with the TLC kibble. Because I mix my bill is less and I can spread out the food .